OMG!!! Thanksgiving is here! My hoomanz are dragging me to a gluttonous fest…help! Do you have wine suggestions for Thanksgiving? I don’t know what to do! Do I bring a box of wine? Do I bring more than one kind? Do I bring a gift (they’re all pet lovers)? Please help out a dog-bro, Rolo…help me, Rolooooooooo! First of all, cut the whining. You’re a dog. Be grateful they’re pet lovers there. Keep em fed, drinking and entertained. Hoomanz love that. They seem to live for that type of stuff. It’s easy to get them to perform tricks for you. And please…NEVER show up anywhere with boxed wine. Never. That’s how dogs end up at the pound. Or at least one of the top reasons; showing up with boxed wine. Don’t be THAT dog. Okay, now that we’ve established that, let me move on to your question. Always have some dog decorum when you attend a gathering of any kind. Dogs that show up with boxed wine, or cans of wine show a lack of wit and deserve to have animal control called on them. It’s that simple. Unless of course you’re by the railroad tracks late on a Tuesday evening, but that’s another story for another time. That’s when you get in touch with your bad dog self. Anyhoo…bring two bottles. I suggest a Viognieror a Rosé. These make for good starter wines when you hit the appetizers. Take a look at my photo here at top of this post; that’s a nice Viognier. And have some manners. Bring a gift. Check out what my hooman pals here at OMG made; they’re pretty cool Pet Ornaments for you to bring over on Turkey Day. You don’t want your hosts and their 4 legged friends to think you’re a ruffian of some sort, do you? And of course, you’ll want a nice red wine of some sort for the dinner. Wine suggestions for Thanksgiving don’t require a lot of knowledge, just a little thoughtfulness. I like Pinot Noir, Syrah, Petit Syrah, or Zinfandel. Real Zin, not that White Zinfandel stuff. That’s another way to get put in the corner or tied to a tree outside during dinner. Hey you know what? I just remembered that I wrote about this stuff last year. 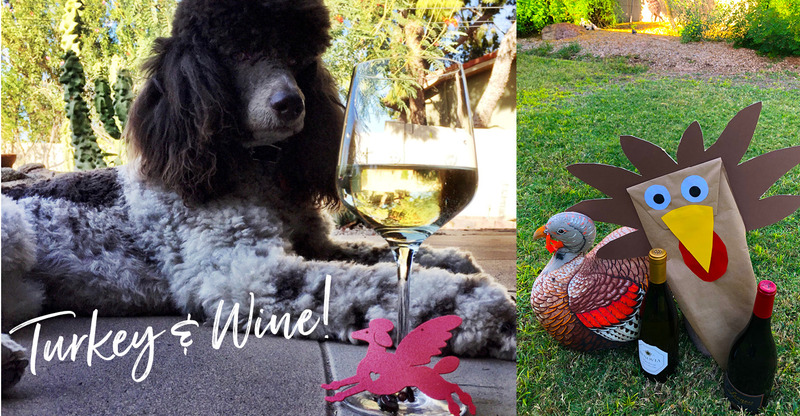 Check out this blog post on wine suggestions for Thanksgiving from 2017 at this link titled Rolo’s Advice on What Wine Dogs Should Bring on Thanksgiving. Go back and take a read at what I said about the foods these wine suggestions to go with. Show up and be that dog-o-the-fine. And while you’re there, offer to help with the decorating. In addition to the pet ornaments I told you about, you can bring a Pet Angel. Hint: even if they have a cat, they’ll be pleasantly surprised with the cat ornaments or the cat angels. Yep, Hoomanz love those things. They’ll go all gaga for you when you show up with wine and more gifts. Just remember, have fun but don’t drink too much and start barking for no reason whatsoever indoors. You’re welcome! And as always, be large and in charge!